Suunto launched their new Essential Collection globally on March 12th after its launch in Asia Pacific in January. The collection is a new direction for Suunto with new channels and new products targeting true and inspired adventurers as well as high-end watches lovers. We got the chance to visit the Headquarters in Vantaa and discuss with Andreas Theer, Product Manager for the Essential Collection. Andreas has been working with Suunto for a year and proudly presents the new collection as specifically designed for adventurers. ‘You won’t find the Essential Collection watches in sporting goods channel. We are focusing on storytelling, premium brand experience and design.’ Suunto has already given a preview of their more premium watches in 2009 when it launched the Elementum Collection. 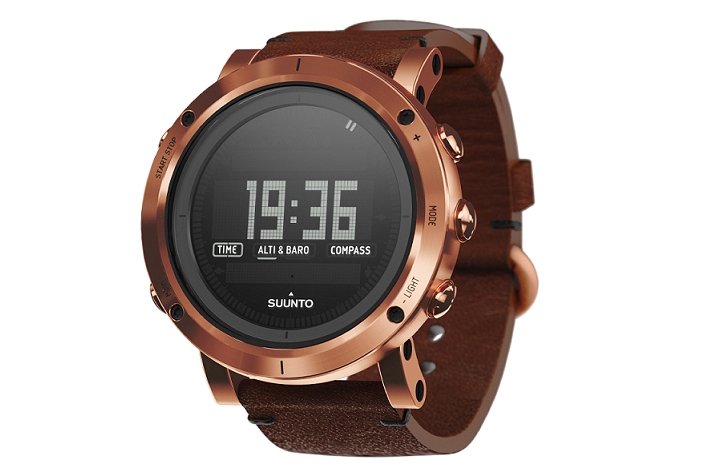 Suunto’s new collection includes six different watches: Suunto Essential Copper, Gold, Steel, Carbon, Slate and Stone. The first four of the collection have a brushed finishing and come with a leather strap, while the last two have a matte finishing and a textile strap, positioned in two different price ranges. The leather watches cost 650€ but if you prefer the textile strap you can get it for as low as 590€. Regardless of the price, they all have been designed with the same features and functionalities and give the consumer the same experience. According to Andreas, the watches are digital, made of stainless steel and sapphire glass and have ABC functionalities, which stand for altimeter, barometer and compass, the essential features for surviving in the wild. This shows Suunto’s background as a sport watch maker that comes from diving and outdoor products, now within a premium design. ‘We want to give the highest quality to the consumer which is why the watches are handmade in Finland. Finland is rough, tough, cold and dark, which is also a quality certificate in a way. We have to be proud of it. Every watch is visually inspected to ensure it’s of the best quality.’ Andreas added. And the new collection is also suitable for women despite its sturdy look, the golden version has been designed with a shorter strap to appeal more to women consumers . ‘Women using this watch will be sending a strong message’ Andreas explains. The adventure starts with opening the traditional, old stylish package, unwrapping the textile roll and finally unveiling the watch. In addition, the package includes a pencil, a field notebook, a cleaning cloth, a quick guide and a quality certificate, personally signed by the person who has assembled it. As we can clearly see, Suunto invested a lot of time and effort in creating the premium watch design and we have learnt it has been a 2 year long kept secret until its launch in January this year in Asia. However, Andreas assures there are more surprises from Suunto on the way. Is this the beginning of a luxury collection era from Suunto?